Australian business luminary David Gonski has participated in three communal functions in less than 24 hours…a Magen David Adom lunch, a cocktail party for the Moriah Foundation and breakfast with the JNF. The luncheon held at Sydney’s Shangri-La Hotel was entitled “An Audience with David Gonski” and was organised for MDA by Max Markson. It was attended by almost 200 guests who paid top money for a “private” audience with the distinguished businessman. No mainstream media were present at the event and Gonski allowed the lunchtime guests a more a personal insight into the man and his family. The function took the form of an interview with Gonski by Sky Business News journalist Brooke Corte followed by a Q&A. MDA President Alan Bermeister told of the work carried out by the organisation in Israel and a video WAS shown of MDA in action. He appealed to the audience to help raise $100,000 for a new ambulance saying that the “wailing of an MDA ambulance siren signals that help and relief are but a few minutes away”. Gonski spoke of working with Cate Blanchett but named among the more impressive business people he had worked with Frank Lowy, Kerry Packer and Rupert Murdoch. Whereas he spoke mostly on personal issues, his mood became more pointed when discussing the plight of today’s media emphasising that the current practice of information being free on the Internet had resulted in the cutting back of journalistic staff in major media outlets and a subsequent drop in quality. He advocates paying for content. In the evening, Gonski attended the Inaugural Moriah Foundation Members cocktail party at the home of Steven and Judy Lowy. The work of the Foundation includes a capital appeal to raise funds for the sustainability of Jewish education for all Jewish children. The Foundation has also secured scholarships to allow children to attend Moriah and has subsidised eight children to participate in the Year 10 Israel Study Tour. $100,000 has been secured to lend to parents who can not fully finance their children going to Israel on the IST. 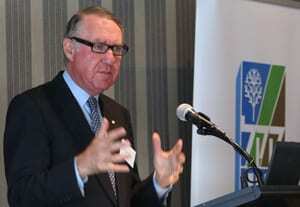 David Gonski spoke to the group about the recent eponymous report he tabled to the Government on education. This morning, our intrepid doyen of big business got suited up and headed off for breakfast with the Jewish National Fund at the Royal Motor Yacht Club in Point Piper addressing them on the subject of leadership. No-one can accuse David Gonski of being lacking in the communal involvement arena. J-Wire salutes him.